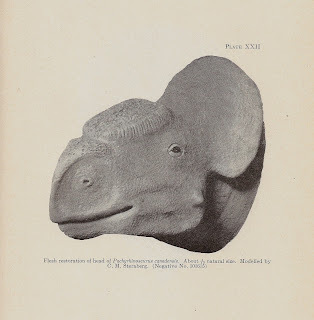 "The specialized development, the large massive head and the great thickness of bone is suggestive of the freakish development that took place among some of the dinosaurs near the very close of the Cretaceous, about Lance time." *Back then, the Ceratopsia was a sub-order, divided into two familiest: Chasmosauridae and Centrosauridae, so Sternberg erected a third family. 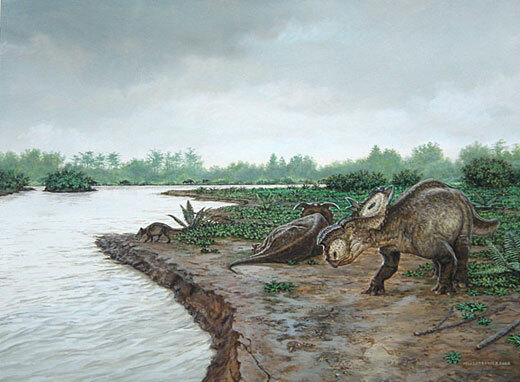 Today, we recognize the Ceratopsidae as a family, with the Chasmosaurinae and Centrosaurinae as sub-families. Sternberg's Pachyrhinosaurus-centric group still exists, however, as the Pachyrhinosaurini, which includes both species of Pachyrhinosaurus and Achelousaurus. Pachyrhinosaurus has long since been a favorite of mine as well for precisely the reasons you've cited. my only humble request, as an avoid follower of palaeo history (especially those that worked in alberta at some point). could you either refer to "charles" with his m middle initial (for mortram, one of my fav names :P) or as charlie (as was his popular nickname) to differentiate him from his dad charles h. sternberg. anyways just a timing issue. as i hit this sternberg problem two nights ago. now that my (non angry :P) rant is done, i thank you again for the great intro to pachyrhinos discovery! Sure, Craig. I keep meaning to get back into the Art Evolved swing of things, but my new job's been keeping me VERY busy. I'm only now getting a firm schedule down.